Russell Leibfarth was born on January 4, 1922, in Stamford, Connecticut. He enlisted in the Aviation Cadet Program of the U.S. Army Air Forces on May 1, 1942, and was commissioned a 2d Lt and awarded his pilot wings at Marianna, Florida, on March 25, 1943. After completing P-47 Thunderbolt training, Lt Leibfarth was assigned to the 486th Fighter Squadron of the 352nd Fighter Group in England from September 1943 to March 1945. 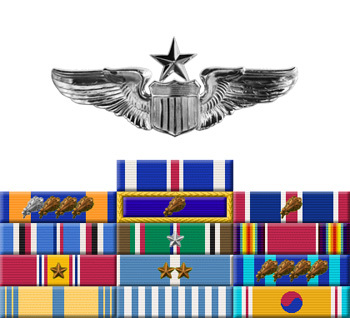 After the war he completed Army Finance School and later served as commander of the 3203rd Supply Squadron at Eglin AFB, Florida, before deploying to the Far East Air Forces for the Korean War in February 1953. 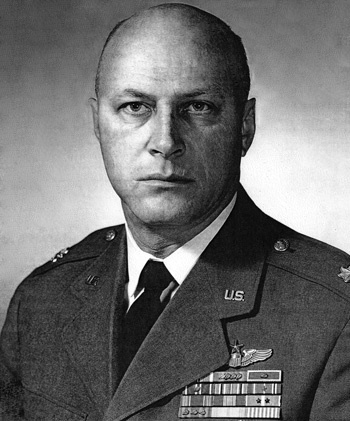 Maj Leibfarth served with the 49th Maintenance and Supply Group from February to March 1953, and then served as executive officer of the 6156th Air Base Squadron from March to June 1953. He was executive officer and then commander of the 58th Supply Squadron from June to November 1953, and then attended Air Command and Staff School at Maxwell AFB, Alabama, from December 1953 to July 1954. His next assignment was as a purchasing and contracting officer with the 803rd Air Base Group at Davis-Monthan AFB, Arizona, from July 1954 to September 1957, followed by service as a procurement officer with the 96th and then the 11th Air Base Groups at Altus AFB, Oklahoma, from September 1957 to October 1959. During this time he served on temporary duty as part of Operation Crowflight to Buenos Aires, Argentina, from August 1958 to October 1959. Col Leibfarth next served as a procurement officer with the 4228th Combat Support Group at Columbus AFB, Mississippi, from October 1959 to August 1962, and then as director of procurement and production with the 3902nd Air Base Wing at Offutt AFB, Nebraska, from August 1962 until his retirement from the Air Force on March 28, 1966. Russell Leibfarth died on March 13, 2013, and was buried at the Dallas-Fort Worth National Cemetery in Dallas, Texas. For extraordinary achievement in aerial flight over enemy occupied Continental Europe. The skillful and zealous manner in which these Officers have sought out the enemy and engaged him, their devotion to duty and courage under all conditions serve as an inspiration to their fellow flyers. Their actions on all these occasions reflect the highest credit upon themselves and the Armed Forces of the United States.